>Two players make a fist. On the count of three, both players reveals rock, paper or scissors. Rock beats scissors (smashes it). Scissors beats paper (cuts it). Paper beats rock (covers it). To make a rock, make a fist. To make paper, lay your hand flat. To make scissors do the peace sign but with your hand pointing sideways (pointer finger and middle finger pointing straight out of a fist). This is a fun way to decide who goes first when playing a new game. Make this a family activity: Have a tournament. 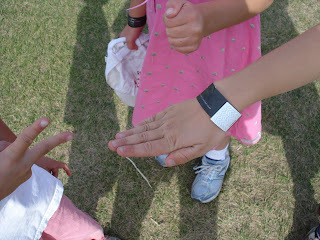 This activity promotes the ability to predict the actions of others as well as timing and strategy.